Behind the Scenes… "The Call"
Me: Hello, may I speak with New Author? Me: Hi, this is Rachelle Gardner. How are you today? NA: I’m fine…wait…did you say Rachelle Gardner? NA: This is Kelly, isn’t it. Ha ha, very funny, Kelly. Me: Um, no. It’s Rachelle. Would you rather speak with Kelly? NA: No! Uh-oh. Not Kelly? Um…oops? Me: No worries. I get that a lot. I’m calling because I really like your book and wanted to discuss representation. NA: Of me? I mean my book? NA: Wow. This is so cool. I loved all the nice things you said in your email, but I didn’t want to get my hopes up. Me: I take it that means you’re open to talking about representation? Me: Great! First, I’d like to make sure I’m clear on the status of the manuscript. It’s not been represented by another agent? NA: No, I’ve never had an agent. Me: And it’s not been shown to any publishers? NA: Not yet, although there was this one editor I met at a conference who said he’d like to see it. I hadn’t decided yet if I wanted to send it to him. Would that have been a problem? Me: No. But if it had already been seen and rejected by a dozen publishers, that would affect my ability to represent it in the market. I assume you’ve shown this to other agents. Have you received other requests for manuscripts or offers of representation? NA: No offers yet, but two other agents requested partials. I sent them a few weeks ago but haven’t heard back. Me: Okay, good, thanks. Let’s talk about your goals for a moment. Beyond this first book, how do you see your career progressing? NA: Well, I have another novel in the works that’s a lot like the one I sent to you. I like the women’s fiction genre a lot, but I also have ideas for a thriller and a young adult fantasy. Oh, and I’ve written two paranormal romances, though I’m sure they’d need lots of editing. I wrote them a long time ago. Me: My approach would be to start with the book you submitted, see if we can find a home for that. It’s usually best to stick to one genre at least until you get established. Then we can look at expanding into other areas. And if we do that, it might be best to use a pseudonym anyway – to keep your readers from getting genre whiplash. NA: That makes sense. But I thought you didn’t rep fantasy or young adult novels. Me: You’re right; I’m not actively seeking those kinds of novels. But when I choose to rep authors, I make a commitment to their whole body of work, unless that includes books I just don’t have the right contacts and expertise to handle. Me: I see you read my blog. NA: Every day. So… what’s next for my book? Will you start submitting it right away if I agree to representation? Me: I’d like to give it a line edit and make some suggestions to polish it, but I think that can be handled in the next few weeks. Once we’re both satisfied that it’s ready, we’d start submitting. NA: Do you know who you’d submit it to? Me: I have some ideas, but I’d need a little time to carefully consider which houses, imprints and editors are the best match. For a novel like yours, I’d probably submit to about eight editors to start with. I’d send you the list after I’ve submitted. NA: Um…can I ask you something a little off-topic? 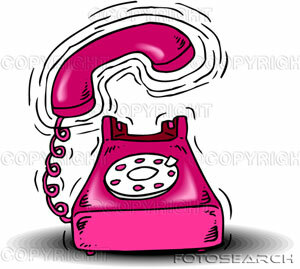 NA: Is it normal for authors to sweat profusely when they get “the call”? Me: Ha, I don’t know. No one has ever mentioned that. NA: Based on personal experience, I think it might be. Oh, and I have more real questions, too. NA: I’m wondering how you usually communicate with your authors. And how often. Me: I try to keep my clients informed whenever there’s anything happening. So you’ll know when I’ve submitted your project and I’ll update you when responses are coming back from editors. If there’s a lot of activity on your book, I’d do my best to email updates every couple of days. NA: So mostly you use email? Me: With day-to-day stuff, yeah. It’s just easier. But I like to keep in voice contact with my clients too. So whenever we need to talk something out, I’ll schedule a phone call. Scheduling calls helps me manage my workload, but as my client, you’re also welcome to call whenever you need to. NA: Even if it’s just because I’m freaking out? NA: So if I say “yes,” what would happen next? Me: I’ll send you our Agency Agreement to sign and return, and we’ll take care of administrative stuff like getting your contact information. Then I’ll get to work on your manuscript. After editing it, I’d send it back to you to review. And then it’s just a matter of passing it back and forth until we both think it’s ready to go. Meanwhile I’ll be working on my editor list. When all that’s done, I’ll submit it to publishers. NA: “Submit it to publishers.” I like the way that sounds. Me: Okay, what else do you want to know? ME: Good. But if you have any more questions as you’re making your decision, just send me an email. NA: I will. Have I mentioned how cool this is? Me: I’d really like to represent you, New Author. Take some time to think about your decision, talk to the other agents, and then get back to me. NA: Is there a certain time you need to hear back? Me: Not really, but if you’re going to take more than a week or so, I’d appreciate you keeping me updated. NA: I can do that. Me: Well, it’s been great talking with you. Good luck with your decision. I look forward to hearing back from you. NA: You’ll hear from me soon. Literary agent at Books & Such Literary Agency. Coffee & wine enthusiast (not at the same time) and dark chocolate connoisseur. I've worked in publishing since 1995 and I love talking about books! I simply want to mention I am just very new to blogging and site-building and really liked this web page. More than likely I’m planning to bookmark your site . You certainly come with good articles and reviews. Appreciate it for sharing your web site. >That made me smile. And despite a few totally forgivable frazzled moments from the author, it sounds like she did a really great job of keeping it together and asking good questions. The only "call" I've really gotten was when I was notified I won a contest and my collection would be published — and I am ashamed to say I completely dissolved into an incoherent mess. >That made MY heart beat fast. Love it! Thanks for sharing, and congrats to your new (hopefully) client!! >I had no idea about the publisher part. So, I get that it's best to send manuscripts to agents to seek representation instead of sending it to publishers? >This is great. I especially like NA accusing you of being Kelly. My CP's name is Kelly and probably the only person besides my husband that would know the lit agent world and my manuscript well enough TO prank me – even though she wouldn't. >In my case it would be (after I quit hyperventilating long enough) me handing the phone off to my husband so he really, truly knows that yes, agents do exist and yes, Jane's writing is worthy of print and yes, she will get paid for it someday! >If I was "new author," you'd have to add a third character. After hearing a heavy "thud," the new author's husband comes on the line to explain that new author has passed out. >I learned a lot reading this conversation. Thanks for sharing it! But honestly, if I ever get "the call," I don't think I'll be able to be that calm or keep it together that well–thinking that clearly and asking coherant questions. I'll probably come off like a stuttering, fumbling fool. Still, I'd like to give it a shot. >Loved this post! It sounds just like how I will act when I get "the call!" >Loved it! The power of story as a teaching tool just scored another victory! >Thanks for letting me live my fantasy today. >Loved this, Rachelle! It kind of made my heart palpitate. Is that normal? Hope you had a wonderful week away from blogosphere. >Thank you, Rachelle. This is inspiring to me in a what if kind of way. Also, congratulations Ms. Jordan, I imagine it was just as exciting as the dialogue implies and am impressed you were able composure at all! >It took me a while to search on the web, only your site unfold the fully details, bookmarked and thanks again. >This was a fun way to show us how it would go if dreams came true, etc. I like tutorials like this (spelled out, LOL) and especially all the links. When I was at ACFW conference last month, I didn't think I was ready at all for this kind of step, but there's always a new day. I'm ready to hear this kind of thing now. Argh! Usually I've just been the one helping someone else. >I feel so old now– when I got The Call, it was from the editor of a major publishing house. No agent would touch my stuff, so I had to sell it myself. This was back in the olden days: 2005. And the reason it worked that way, I think… agents take on far fewer new writers a year than do major publishers. >My hubby and I took a few days off last week to do some oceanside camping. Now that I'm back I'm glad to see you are, too. I hope your break gave you lots of opportunities for personal refreshment. I loved this post. It echos my fantasy about The Call although I suspect if I were New Author I'd be sputtering incoherently not asking intelligent questions. E-mail gives time for compiling thoughtful messages and responses but I wonder, do you ever use Skype for conversations with your authors? >Do agents always email first? If so what is in that email? And do you tend to call during the day, in the evening, or on the weekends? Maybe that is a silly question – but I wonder. >This is hilarious and so cool! Thank you for sharing! I agree with Beth–there is no way I'd be able to think straight and remember to ask all those questions! >I can't wait to make this call one day! I really hope that my authors dance and scream like they just won the lottery. I would love them so much more! >This is great! And "New Author," it really wasn't me calling! (Kelly). I've recently had a published author offer to mentor me through the book writing process. Very exciting, so I can relate to what your new author is feeling! Congrats to both of you!!! >Funny, but probably pretty true, although I think most authors who get "the call" aren't quite this coherent. >Congrats to both you and NA. And thanks for this post. It keeps alive my hope that one day I will be the one getting that call. >This was awesome and educational. If I received said call I don't know if I'd be half as collected as New Author. This post made me smile. OMG It's silly, but just reading that made me all excited as if I was the New Author lol. I REALLY want that to happen to me! But I'd probably be really stupid and be like, "Why wait for my answer?! Yes, yes yes!!" But I can definitely see how smarter thinking it over is. >LOL This is sweet and funny! Thanks for sharing. >My "agent call" came by e-mail, but it was no less exciting. There are so many levels of discouragement when it comes to writing, so these are the moments which make it all worthwhile. >So great. Thanks for sharing! >Isn't this every writer's dream phone call??? The process of MS submission is so confusing and scary for first time authors. This conversation reveals the light at the end of the tunnel. >~ just in case… you ever call me. >This was really great. I only wish I'd get the 'call' already. and be on the phone sweating like mad. >Thank you for the entertaining and informative post. It makes my heart ache for the day that I will receive 'the call'. Thanks again for the great post! Your blog posts are like a ray of sunshine breaking through the clouds on a cloudy day. >That was very fun! I can only imagine the adrenaline rush your clients must have had when receiving the call. What a great way to start the week and a sign of good things to come. >I hope you don't mind if I read this every night before I go to bed so I can dream about it. Sounds a lot like the conversation I had with my now agent! It was from reading agent blogs, like yours, that I knew what questions to ask!!! This was great. Happy Monday! >Awww; that nearly made me cry. >Ahh, I like that 🙂 It's a good reminder, too, to know what you want in an agent. I like that you said the author wanted to know if you represented her or her book and the answer was yes to both. A great thing to look for in an agent. Thanks for the run-through. >I love this. What an inspiring way to start the week! >I read this with a smile on my face. An agent asked for the full of my YA fantasy novel and I'm in the "waiting and hoping for THE CALL" phase right now! I'm not sweating profusely, but my heart IS beating faster. Of course, that could be the two mugs of coffee I just had. Caffeine does not help an author who is waiting for THE CALL. >Thanks for the post. I appreciated seeing how you work with new authors and the first steps you take to get them published. I hope to be among the few, the proud, the represented soon. >Ha ha! This is so awesome!! Is it fun to know that you get to make people's days (or months or years?). I bet making those calls is the best part of your job… well, that and making calls to tell authors that you have an offer on their book. >Good to have you back! >hehe- yep 🙂 Some day. But I'll try to remember to hang up. First, welcome back to the blog-o-sphere. Hope your time away was productive and refreshing. Thanks for posting this. Since our conversation (actually our exchange of emails) was a little different, I really enjoyed seeing how the real thing would take place. But however it happened, I'm so pleased to have you representing me. >Thanks for using NA instead of my name…hehe. 😉 When I read the email offering representation, I burst into tears. Yeah, I'm a sap. >So much wishing I were New Author. >One day I'll wish upon a star…. >This sounds like a fun part of your job! >I sweat every single time I talk about something important. That's why I wear black to 99% of my speaking stuff. >Or if it was on Skype, you'd see the Snoopy dancing! >LOL- this was fabulous. It's great to see what a real live agent might say if we get 'the call'. (somehow my day dreams don't amount to much besides "Hello, this is your fairy god agent here to answer your prayers.") Thanks Rachelle! I love books and publishing and talking incessantly about them. I love authors and all the intricacies of managing a writing life. I sell. I negotiate. I coach. I brainstorm. © 2019 Rachelle Gardner. Site by Micah J. Murray. Site by Micah J. Murray.